Windows, Meet Linux. Linux, Meet RemoteApp! Wine has always been about 50 steps behind Windows in terms of the API. It doesn't run the apps I need it to. In fact, outside of World of Warcraft via Wine, which was a difficult configuration, I've never really been able to get anything to work like it should. That especially goes for my important applications, like Microsoft Office and Adobe Fireworks. Virtualization works well but gets a bit in the way sometimes on the local machine. Virtualization is an optional part of the solution, though I recommend using a dedicated virtualization server or locally-hosted private compute cloud. Well, that is unless you have much more RAM in your notebook than I do. Seamless virtualization with VirtualBox seemed almost promising with the advent of separate desktops via virtualization. For the same reasons, it was in the way when running locally, which was the only time that seamless mode ever seemed to work for me at all. Still there was the awkward minimizable taskbar and I wanted a full integration so that I could easily launch my Windows apps from my GNOME menus by simply running the application. VNC works for single apps, so it would follow that it could be modified to push certain apps out by using a server launcher. 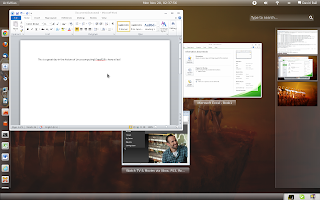 The key problem with VNC is that two remoted apps must share a single desktop workspace, and that real-estate is limited by the physical screen resolution and the number of actual monitors. That won't work for running many remote apps simultaneously. Meet FreeRDP, a coming-of-age RDP client for Linux destined to replace rdesktop as the popular client. It is a shiny new drop-in replacement for rdesktop. Let us first talk about setup. Windows Server 2008 or 2008 R2 with Terminal Services and RemoteApp enabled and properly licensed. Experience compiling your own software. I have Ubuntu 11.10 64-bit (amd64) for my clients. For now my Windows Server 2008 R2 is running on bare-metal hardware, but I am picturing moving that to a virtual server in the very near future. My instructions will be for Ubuntu 11.10 amd64. You can modify them as you will to fit your distribution. Create integration files used to run any of my hosted RemoteApp programs. For this example, my server is hosted at 192.168.1.100 and my user name is david and my password is password (it isn't really, but you get the idea). #Description: Launches RemoteApp with command line arguments. #Depends: convert_local_to_remoteapp, Python 2.x, pwd, and POSIX $HOME. #Notice: Should work on just about any Ubuntu. echo "Use --convert-linux-path followed by a local path to convert it to a remote path." echo "Example: remoteapp '||winword' /f --convert-linux-path $HOME/myDoc.docx"
xfreerdp -z -a 32 -x l --app -u "$REMOTE_USER" -p "$REMOTE_PASS" --plugin rdpsnd --plugin rdpdr --data disk:home:"$HOME" disk:vfsroot:/ -- --plugin "$HOME"/src/FreeRDP/channels/rail/rail.so --data "$REMOTE_COMMAND":"$REMOTE_WORKING_DIR":"$REMOTE_COMMAND_ARGS" -- "$REMOTE_HOST"
You may also add --convert-linux-path to convert a local path to a RemoteApp path on \\tsclient. remoteapp '||winword' /f --convert-linux-path "%U"
remoteapp '||excel' /f --convert-linux-path "%U"
remoteapp '||powerpnt' /O --convert-linux-path "%U"
Use it like this: How to Create Custom Application Launchers in GNOME 3. Just remember to put your icons in /usr/share/icons as root user. Buyer beware: I've had to manually log in to my server and reset connections when they don't exit properly. For some reason, it doesn't work after 3 concurrent connections; perhaps a licensing glitch on my end. Maximize doesn't render on my screen. The clipboard integration package doesn't work. And, I haven't quite figured out the RemoteFX capabilities on neither Windows Server 2008 R2 nor FreeRDP. Despite these limitations of the pre-release version, this is perhaps one of the best integration successes I have had to date. Way to go FreeRDP team!